With contributions from some of the world’s leading experts, Dr Charles Donovan has assembled the most comprehensive work to date on the subject of sustainable energy finance. The book begins with a foreword by former CEO of BP, Lord John Browne, who describes the remarkable transformation in the global energy landscape over the past 50 years. Most striking perhaps is its transition following the market liberalization of the 1990s from a state-led interest to one driven by private investors. Reconciling public and private interests, balancing market forces and resolving trade-offs between risk and return in climate mitigation efforts are the key tensions at the heart of this book. Divided into three sections, the first sets up the challenge of financing renewables at scale. In ‘the clean energy imperative’, Jim Skea provides a lively discussion on the drivers of renewable energy expansion, with a focus on the status and characteristics of different technologies and their potential for reducing CO2 emissions. The second chapter, by Bloomberg New Energy Finance guru, Guy Turner helps to quantify the amount of investment required for energy-hungry nations to reach global climate change targets. 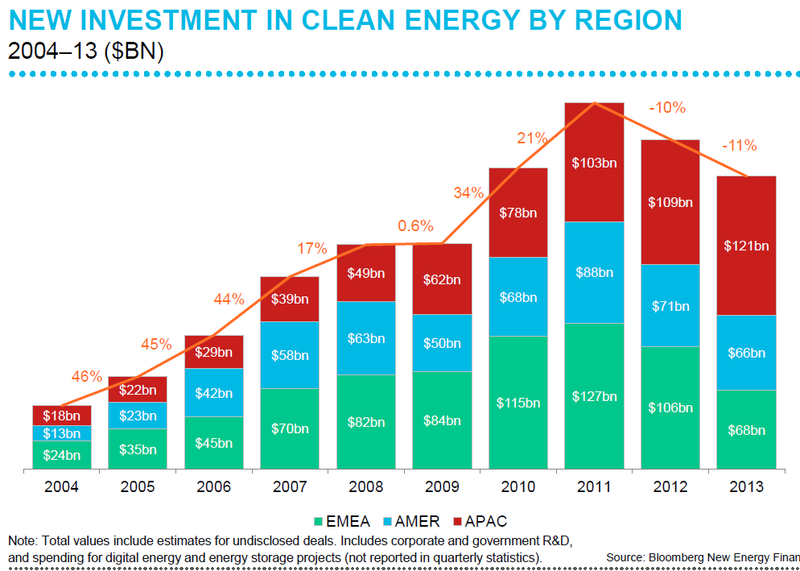 Alongside familiar figures detailing the decline in clean energy investment (Figure 1), this chapter provides an important update highlighting the growing cost competitiveness of renewable technologies and not just the current gap in available financing. The section concludes with a chapter on the building blocks of financial decision-making, especially the challenge of measuring risk and return in incomplete and uncertain markets. Section two takes a closer look at some of mechanisms used to mobilise investment capital into renewable energy. It sets out a familiar premise that while renewable electricity projects produce a valuable (and tradable) commodity, it does so at a cost which is generally higher than existing market prices, thus requiring some government intervention. Professor Richard Green’s chapter considers some of these interactions and how they fit with the physical or technical characteristics of electricity. For instance, the delicate act of balancing demand and generation due to difficulties in energy storage and the reliance on the grid system as a ‘coordinated unit’. Gireesh Shrimali’s chapter is on the impact of government policies on incentivising renewable investment, and provides fresh analysis of how a number of policies act to lower financing cost through a number of real-world energy projects in Europe, USA and India. The results from these cases tell a fascinating story about the impact of different policy interventions and the variations resulting from the context. The second half of this section places similar emphasis on context and considers the future of renewable energy investments in China and the developing world. With over US$18 trillion of energy efficiency investment through 2035 forecasts to come from outside the OECD, crowding in private sector capital in the developing world is a crucial ingredient. Chapter 6 provides a new perspective on what has so far been largely left unstudied. It discusses the political and economic complexities of investing in the developing world, as well as the shortcomings of existing financing mechanisms. The key point in this chapter is the need to foster a ‘virtuous circle’ in renewable energy finance by mobilising local sources of private capital. A phenomenon which has received far greater interest in comparison is the rise of renewables in China. In Chapter 7, the authors compare the problematic wind energy boom, which at odds with the country’s grid development program has led to overcapacity and huge connection problems, with the immense success of solar PV manufacturing. The greatest difference between the two seems to be the coordinated policy incentives tailored towards local, national and international governments. The section concludes with a timely discussion on carbon pricing and the current failure of policymakers (as well as rating agencies) to make fossil fuel technologies more expensive by factoring in their social cost. The third and final section concludes with an in-depth look at the sources of capital, in particular a look at the growing role of private equity, continuing supply of credit finance from commercial banks, and unleashing the ‘untapped potential’ of institutional investors and even crowdfunding. In chapters 9 to 13, the most compelling insights were i) the future of public-private investment partnerships in reducing perceived risk towards the green energy sector and ii) the potential for crowdfunding in attracting local capital towards community-based renewable energy projects. Raising money from crowds represents a relatively new source of capital, which currently faces numerous practical and regulatory hurdles before it represents a scalable solution. These issues are set out by the founders of Abundance Generation, a crowdfunding platform which has already raised nearly £11million from high street investors into UK energy projects. Meanwhile public-private partnerships can play a much great role in attracting large investment by increasing risk appetite amongst investors and providing nearly £3.8 billion in credit and equity finance to distressed developers, not to mention the amount it crowds in from banks and institutional investors lacking the expertise to invest in the sector, despite healthy returns. One way it does this is through listed funds such as Greencoat, which yields 7-8% returns. 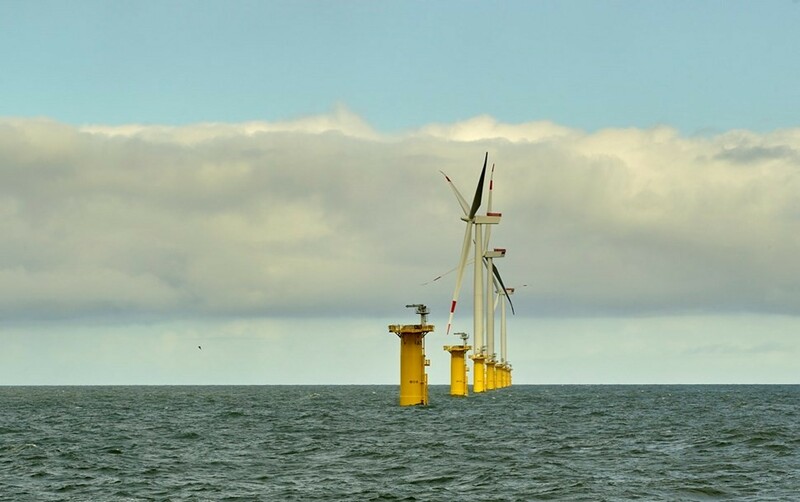 Another example of mobilising large amounts of capital is the UK Green Investment Bank’s recent acquisition of £236m stake in a joint venture with E.ON to construct and own the 400MW Rampion offshore wind farm, off the coast of Brighton. It is expected to generate 1,333 GWh of renewable energy annually, enough to power approximately 300,000 homes, and reduce greenhouse gas emissions by 4,215 kt CO2e over its lifetime, the equivalent of taking 75,000 cars off the road. Such examples give some idea of the impact that public-private investment partnerships can bring to the sector. ‘Renewable Energy Finance: Powering the Future’ is an excellent resource for students and academics pursuing research in renewable energy, environmental studies or finance and related disciplines. It is equally relevant for investors and industry professionals who want to know more about the challenges and opportunities that renewable energy technologies can bring.